The Turkish military said those killed in Sunday's air strikes were Kurdish militants. Separately, a monitoring group said at least 35 civilians and four militants were killed by a wave of Turkish strikes in the same area. It is not yet clear whether the two reports relate to the same incident. The strikes came on the fifth day of Turkey's military operation to target so-called Islamic State (IS) militants and Kurdish militia inside Syria, dubbed Operation Euphrates Shield. Speaking in Gaziantep, where IS militants killed 54 people at a Kurdish wedding last week, President Recep Tayyip Erdogan said "operations against terrorist organisations will continue until the end". 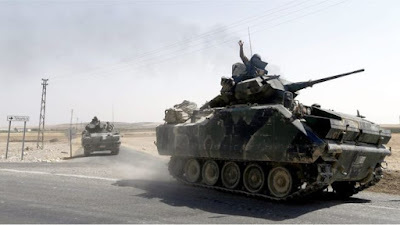 Turkish tanks and troops backed by Syrian rebels have captured territory from IS and clashed with the Kurdish People's Protection Units (YPG), a Kurdish militia supported by the United States, which is itself fighting IS. Turkey's coming into conflict with the Kurdish People's Protection Units (YPG) or their Arab allies could further complicate its military campaign. Ankara wants to force the Kurds to withdraw to the east of Euphrates River, stopping short of establishing a corridor to link two Kurdish-led areas in north-western Syria. Turkey enjoys tacit support from Russia, the Assad government and Iran in acting to prevent further territorial gains by the Kurds and their allies. The US, on the other side, has said it will try to prevent Turkey coming into conflict with its allies in the region. A possible Turkish campaign against the Kurds in Syria could also risk igniting further clashes with the Kurdistan Worker's Party (PKK) militants inside Turkey. The PKK recently upped its attacks significantly in correlation with the Turkish operation inside Syria. The UK-based Syrian Observatory for Human Rights said 20 people died in strikes on Jeb el-Kussa and another 15 were killed in a separate bombardment near al-Amarneh. Four local fighters were also killed, the Observatory reported. Turkey's military said in a statement that it had killed 25 members of the PYD, an offshoot of the PKK. Jeb el-Kussa is located 14km (9 miles) south of Jarablus and is controlled by local fighters with support from Kurdish forces. On Saturday Turkey's military suffered its first fatality of the offensive, when a soldier died in a tank hit by a rocket. Turkish authorities blamed Kurdish militia for the death. Turkey has been targeting Kurdish-controlled villages around Jarablus, which Turkish-led forces captured from IS on the first day of the offensive. It fears Kurdish fighters gaining an unbroken strip of territory along its border, which would be a huge boost to the Kurdistan Workers Party (PKK), a banned Kurdish rebel group fighting for autonomy in Turkey. 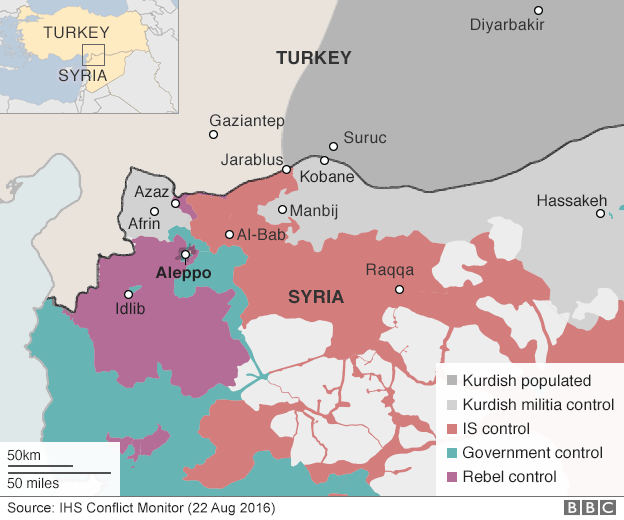 Turkey's operations further complicate the already protracted Syrian civil war. Both Turkey and Kurdish rebels are US allies. The US has backed Turkey's anti-IS operations in Syria, and both countries have demanded that Kurdish forces withdraw to the east bank of the Euphrates river.